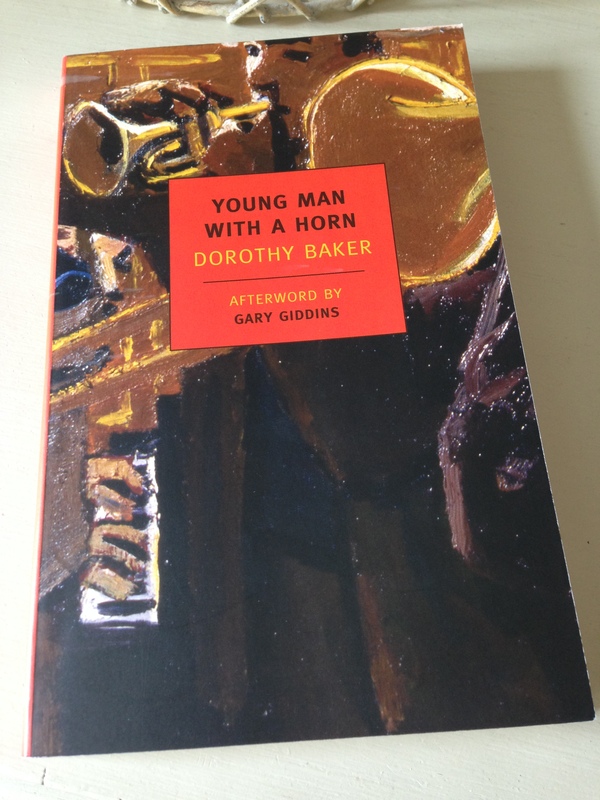 Dorothy Baker’s Cassandra at the Wedding was one of my reading highlights of 2014 and ever since then I’ve been looking forward to trying her debut, the jazz novel, Young Man with a Horn. I’m glad to say it did not disappoint, far from it. This novel is a modest triumph, finely crafted and deeply felt. The remainder of the novel is divided into four sections, each one covering a key phase in Rick’s story. Orphaned as a baby, young Rick is raised by his (largely absent) older sister and brother. By the age of fourteen, Rick is skipping school and teaching himself to play the piano at the All Souls’ Mission church in Los Angeles. Around this time, he meets an eighteen-year-old black guy, Smoke Jordan, at the local Pool Hall. Rick is fascinated by Smoke’s natural sense of rhythm; he can see it in the way Smoke moves across the floor as he sweeps up at Gandy’s Pool Hall. At first, Smoke is a little wary of getting too close to Rick, but a lasting friendship soon develops between the pair as they bond over a mutual love of music. This deep relationship between the two young men (one white, one black) is one of the most touching and affectionate features of the novel, it’s beautifully rendered by Baker. Smoke and Rick spend their nights sitting outside the Cotton Club listening to Jeff Williams and his Four Mutts. This band is hot, the players know what they’re about both collectively and singly, and Rick soaks it all up. Smoke knows the band and one evening the two boys are invited into the Club. Rick is in his in element; he is entranced by the music, not only the piano but the trumpet too. The way Art Hazard plays that horn simply blows him away. Jeff Williams agrees to teach Rick a thing or two about the piano and Art Hazard does the same with the horn. Rick’s world revolves around the music. He practices piano in the afternoons followed by a couple of hours on the trumpet, and in the evenings he heads to the Cotton Club to hear Jeff’s band. Rick just gets better and better; he’s on his way. By the age of twenty, Rick is playing first trumpet in Jack Stuart’s dance band for a summer season in Balboa. Jack, a traditionalist by nature, wants the band to play straightforward arrangements of crowd-pleasing tunes, but Rick is itching to improvise a little; he needs an outlet for his creative juices. There’s a great scene where Rick gets to play things his own way for one dance number. He doesn’t show off, he’s respectful about it and lets the music speak for itself; out comes a sound that ‘could be tender and still hold its own shape’. Four choruses later and Rick has the crowd, they won’t leave the dancefloor. From that point on, every fourth number features a Rick Martin trumpet solo. The final section of the novel moves to New York where Rick shifts up a gear to play in Lee Valentine’s band. Four years on and he’s working in Phil Morrison’s outfit, the leading society orchestra in NYC, playing hotels, drawing a crowd and earning more money than he has time to spend. When his stints with the orchestra are through for the night, Rick heads over to Louie Galba’s, a musicians’ hangout. Here he is reunited with Smoke, some of the guys from Jeff Williams’s band and other great musicians he has met along the way. By the age of twenty-four, Rick has become the big name; he’s the leading trumpet player in America. It is here in New York that the tension between Rick’s creative drive and his ability to keep his life on an even keel starts to rise. His personal life gets complicated when he meets and falls for Amy, a bright and intelligent society girl. I love that quote, it could have come straight out of a Chandler novel (or the film, Casablanca). Rick and Amy are happy for a little while, but it doesn’t last. Rick continues to push, to give himself up to the music, and when the fall comes he takes it hard. Young Man with a Horn is a very fine novel; there is much to enjoy here. Baker writes so vividly and realistically about jazz musicians and their music; it’s one of the many pleasures of this book. As an example, here’s a passage from the scene where Rick is inside the Cotton Club listening to Jeff’s band. Baker also nails the ambience of the Harlem speakeasies, the clubs and hangouts where players congregate after hours. She captures the bond and sense of kinship between these musicians so well. At a time when racial tensions remain present in America, it’s refreshing to see just how natural it is for Rick and one or two other white musicians to jam alongside Smoke and his compatriots. Ultimately though, this is the story of a young man’s fall from grace, of an artist so talented he couldn’t contain it. Even though we know the arc of Rick’s life from the opening pages, the narrative remains compelling and engaging to the very end. I’ll finish with a favourite quote from the novel, one that conveys something of the wistful tone of the closing section. Young Man with A Horn is published in the UK by NYRB Classics. Source: personal copy. This entry was posted in Baker Dorothy, Book Reviews and tagged Book Review, Dorothy Baker, Fiction, NYRB Classics, US on June 2, 2015 by JacquiWine. Cassandra narrates the first section of the novel, and as she travels home we learn more of her relationship with Judith. The two twins used to share an apartment in Berkeley and seemed inseparable, content to live their lives for each other with little need for outsiders. But then Judith departed for New York leaving Cassandra cut adrift and in a state of procrastination over her thesis on French novels. In this respect, Cassandra is also living in the shadow of her deceased mother, Jane, a famous writer and influential figure in the twin’s lives. “Is Jude wrapped up too?” I said. I said it possibly a little too loudly or pointedly just to let her know how a phrase like wrapped-up sounds to the sensitive ear; but though I meant it only for her, it was my father who answered. Cassandra is a very complex character. She is intelligent, precise and at times witty, charming and loving. But she can also be manipulative, reckless, domineering, self-absorbed and cruel. Her thoughts and actions are full of contradictions, and at times she deludes herself. At heart, Cassandra is emotionally dependent on Judith, and deep down her sister’s departure to New York (some nine months ago) and imminent marriage feel like acts of betrayal. The presence of a grand piano in Cassandra’s apartment – an instrument jointly purchased by the twins – remains a constant painful reminder of Judith’s desertion. The twins were meant to live their lives together, travel to Paris and beyond. How could Judith ever imagine life being any other way? I twitched and got her arm off my shoulder quite fast and quite suddenly. After all, I didn’t have to sit here with some bride and listen to her saying wedding dress over and over. I turned and looked at her. The pounding was very strong now and my eyes felt as if they’d caught fire. I had my glass in my hand, about a fourth full. “You told me so many things,” I said. She stopped, and I wasn’t quite sure I wanted to prod her. Maybe the best would be to keep her stopped, but before I thought how to do it it was too late. That’s about as much as I’m prepared to say about the plot, save to say there’s plenty to come. In the second section of the book, Judith takes up the role of narrator and we hear a very different voice, one that is mature and measured. Cassandra and the Wedding is a brilliant novel; so layered and nuanced I’m already on my second read. It’s a novel about the process of maturing as a young adult. Cassandra has to balance the pull of her relationship with Judith against the need to break free to establish her own identity, and the reverse applies, too. There are allusions to Greek mythology; the girls’ father is a retired philosopher, and their names are not insignificant. And the novel’s ending has an air of ambiguity about it, one that makes it all the more intriguing. 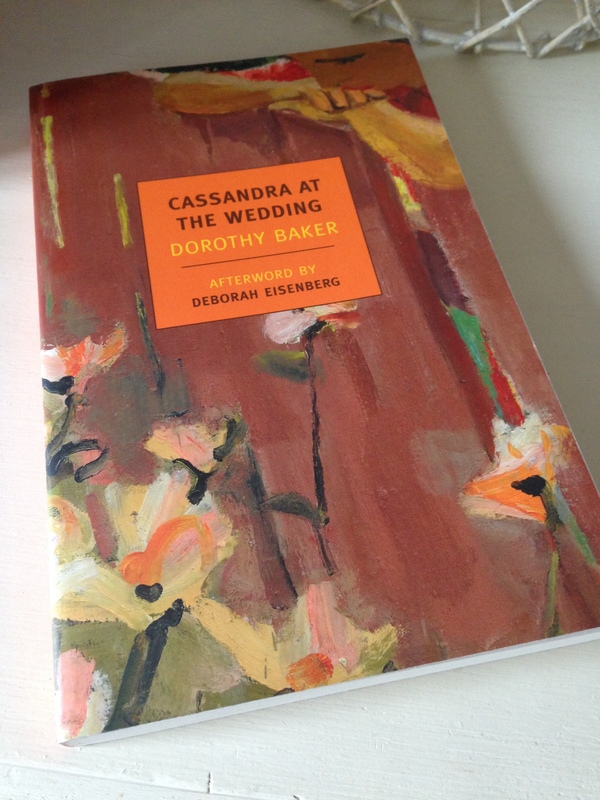 Cassandra at the Wedding is published in the UK by NYRB Classics. Source: personal copy. This entry was posted in Baker Dorothy, Book Reviews and tagged #ReadWomen, #ReadWomen2014, Book Review, Dorothy Baker, Fiction, NYRB Classics, US on October 7, 2014 by JacquiWine.